500 Reps and a Trip to Oz: Training Involution #114 | Robert Mitchell Jr. This week’s training involution is a two-parter. Start with the 500-rep All-in Conditioner (video at the bottom of the post) then move on to a Cross of Light exercise. Warm-up with 8 minutes of light cardio. Then, at 50% power, complete 10 to 20 reps of each exercise to make sure you’re fully warmed up and ready to go all out. Perform every exercise with maximum power and precision. Take as few 12-count rest breaks as you must in order to finish — see video below. 100 Paces of Press Walks. I used two #25 dumbbells but you can substitute a sandbag or another heavy object. 100 max power strikes vs. upright heavy bag. 50 Circles vs. floor heavy bag. 100 mounted strikes vs. floor heavy bag. 50 reverses from bottom position. 50 pop-ups to shin ride position. When we try to orient ourselves we instinctively think of four directions. In Cabal Fang we orient ourselves with the Hermetic Quaternary: To Know, To Will, To Dare — To Keep Silent. But there are tons of other things that map onto this — like the Four Heavenly Creatures, the four classical elements, and rather significantly, the Four Evangelists. I’m convinced that’s why there are four gospels in the New Testament — because it instinctively makes sense that there should be four different versions of Christ’s story, each one from one of four different angles. 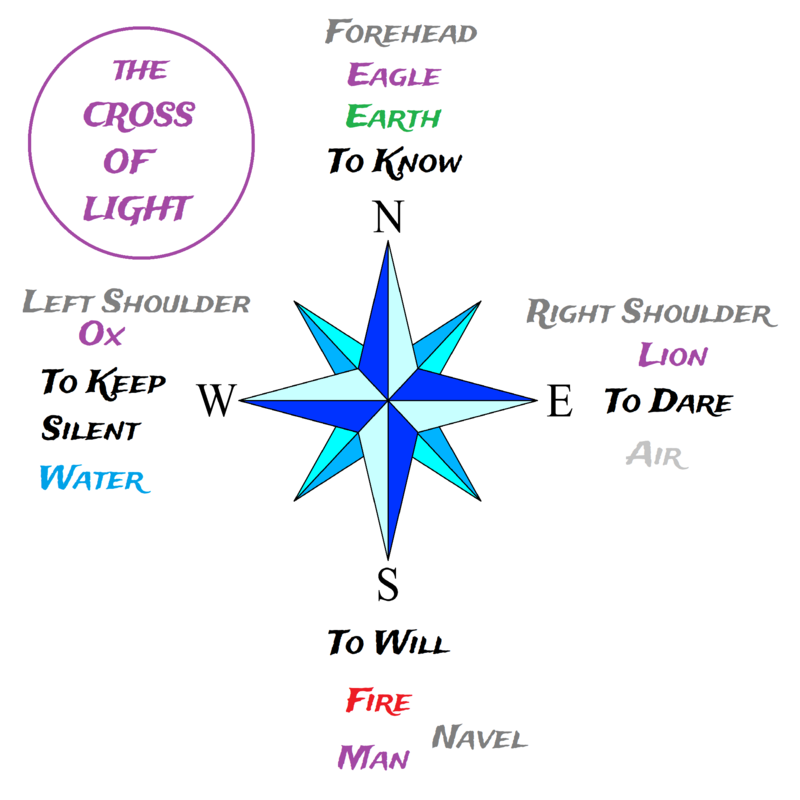 What else maps onto the Cross of Light? Just the other day I noticed that the four characters in the Wizard of Oz film fit perfectly in place on this diagram. The Cowardly Lion goes in the East — he’s in search of courage or daring. The Tin Woodsman is in the West. Water made him frozen and silent, and he’s after a heart which equates to the water of tears of joy, sadness, sympathy, etc.). Dorothy belongs in the South because she is human, and her defining characteristic is her will to go home. And lastly, Scarecrow maps to North because he’s searching for knowledge — but his quest doesn’t begin until he’s cut down and he falls to earth. See what else you can map onto the compass. Here are some ideas: The Fantastic Four, The Four Noble Truths of Buddhism, the Four Horsemen, the four fixed signs of the Zodiac, the four ways of seeing, the Four Alchemical Elements, Plato’s four qualities. Sketch a cross and start mapping. Then, when you’re done, perform the Cross of Light ritual from Chapter 17 of the Cabal Fang Study Guide. 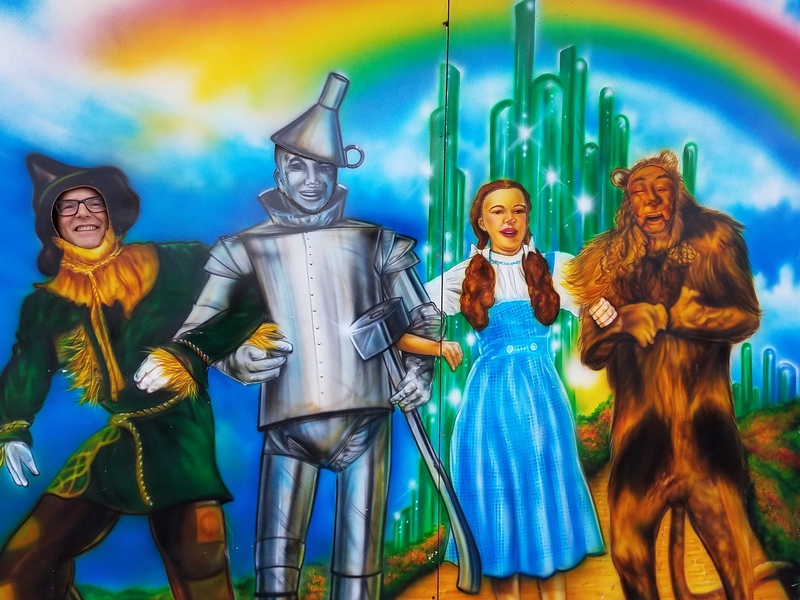 This entry was posted in Martial arts, Mysticism and tagged involution, wizard of oz. Bookmark the permalink.